1930s Lost Catskill Farm Water Wheel Program at the Time and the Valleys Museum, Sunday, October 14th 2 p.m.
[Grahamsville, N.Y.] The Time and the Valleys Museum’s newly opened 1930s Lost Catskill Farm has many out buildings, including a milk house, electric plant and farmer’s workshop with a display of tools powered by a fully functioning water wheel. On Sunday, October 14th at 2 p.m., the Museum is hosting a program on the 1930s Lost Catskill Farm water wheel, located on St. Rt. 55 in Grahamsville Sullivan County. The program will include a short history of water wheels and their importance in the 18th and 19th centuries for sawmills, grist mills and more, given by Lynn Priebe, Museum Trustee and Archives Assistant. Robert Curry of Neversink will explain how water wheels actually work and give a demonstration of the water wheel showing how it powers different tools, and how important these tools were to a 1930s farmer. Built by Walter Cypert (1924 – 2016) of Woodbourne, the water wheel is supplied by water from a pond designed and built by 8th grade students from Tri-Valley Central School Watershed Studies class. Funding for the pond and numerous native plantings around the pond comes from the Rondout Neversink Stream Program, a partnership project of Sullivan County Soil & Water Conservation District funded by NYC DEP. Funding for the water wheel and building comes from Nellie and Robert Gipson and Philip Coombe, Jr.. Admission to the program is FREE for Museum members, and $3 for non members. Admission including admission to the other 1930s Lost Catskill Farm buildings and to the Museum’s three exhibitions. 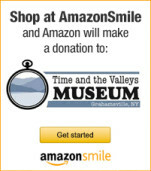 Please call 845 985-7700, email info@timeandthevalleysmuseum.org or go to www.timeandthevalleysmuseum.org for more information.